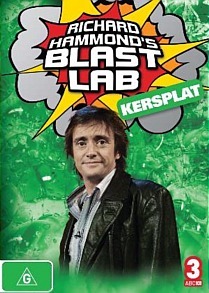 Top Gear's Richard Hammond is not only known to the adult community (ala Top Gear) but even the younger kids know Richard from his science series aimed at this generation called Richard Hammond's Blast Lab Kersplat! Featuring over two hours of crazy experiments, Hammond and friends takes the viewer on an interesting journey as two teams attempt to outdo each other in each episode. If one team fails, they need to blow up their prizes but to the victor come the rewards. This DVD features all 6 episodes from season one and contains some hilarious episodes that include rockets, weighing Ninja rats to more serious experiments such as building hovercrafts. The series is quite down to earth and is well presented by Hammond who has a real charisma that it's easy to see why he is so likeable. This series is currently screening on ABC and on DVD, features HD video and audio that looks fantastic, especially some of the colours and of course the look of his "secret" laboratory. Definitely one for the younger viewers but older viewers may get a thing or two out of this as well. Definitely one of Christmas!